Take this opportunity to learn about the amazing shows and great productions taking place in Branson and Lancaster at the Sight & Sound Theatres. Discover how these shows have been noted as quality form of faith-based entertainment as well as some of the most popular live show productions in the entire United States. Check out the following shows performed at the Sight & Sound Theatres which boast enormous sets and brilliant special effects. If you have additional questions about any of these shows, be sure to contact one of our friendly customer service representatives at 800-987-9852. Experience one of the most beloved biblical tales of all time when you see Joseph at the beautiful Sight and Sound Theatre in Branson, Missouri. This astounding show brings the story of Joseph to life with its heartwarming tales of love and redemption. A talented team of stage performers combined with emotional musical scores, choreographed sequences, and larger-than-life set designs tell the story of Joseph like never before. The theater features some of the most innovative and advanced sound and lighting systems in the area as well as a host of special effects elements that greatly enhance the story. 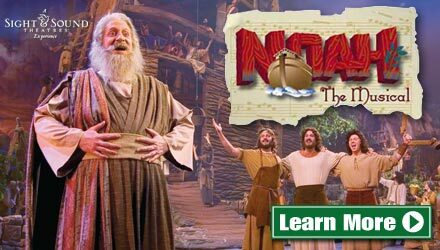 The Millennium Theatre in Lancaster welcomes the production of Noah The Musical in place of Jonah for the 2013 season. Follow Noah on his journey as he fulfills his orders from God to build a colossal ark in preparation for the impending floods. Watch in admiration as Noah and his family overcome the scrutiny of his adversaries while working diligently to complete the task at hand. After the massive ark is complete, watch in awe as hundreds of animals are led through the aisles of the audience and onto the massive stage to board the boat. This stunning performance includes numerous original songs, talented performers, vivid costumes, a state of the art set, and hundreds of trained animals all presented on a 300 foot wrap-around stage. The Miracle of Christmas will once again be showing during the 2013 Christmas season in Branson and Lancaster. As the holidays approach, both theatres will turn toward programming more in tune with the spirit of Christmas. Miracle of Christmas will present the touching tale of the birth of Christ, offering one of the most spectacular nativity scenes in the entire nation. As always, you can expect a larger than life cast comprised of brilliant performers and trained animals, as well as all of the latest special effects. In addition to all of the typical sights you would expect to see at the birth of Jesus, the production will also showcase a thirty foot Christmas tree to help illustrate what this special moment means to us today. The Lancaster Behind the Scenes Millennium Theatre Tour provides a backstage look at exactly how the productions of Sight & Sound come together. Along this informative tour, guests will be shown the cutting edge technology that goes into producing the theater's shows. Those who take this comprehensive tour will also have the opportunity see where the animal actors live and how they're cared for, and will even have a chance to take to the stage for an actor's perspective of the Millennium Theatre! The Branson Behind the Scenes Tour takes visitors behind the brilliant productions in Branson. Guests get to meet some of the cast and crew and see what it takes to bring these biblical tales to life. See how the lighting and stage works and get an up-close view of the spectacular sets. 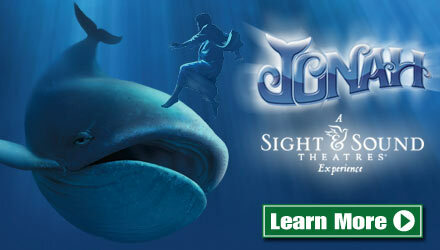 In addition, the tour shows where the animal actors live and are trained for their roles in the productions. If you need any additional information about these shows or would like to speak to someone in person, please call our customer support at 800-987-9852. No matter if you are headed to Branson or Lancaster, get ready for a memorable performance perfect for both the young and the old. We attended the Miracle of Christmas in 2010. Loved it! Would like a c.d. of the show if available yet. We were told maybe next year?